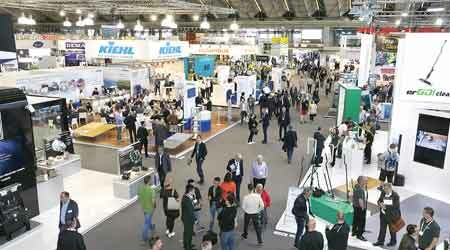 Two years ago at the last Interclean show, Internet of Things garnered a lot of attention. However, IoT hasn’t taken hold in the cleaning industry yet, for a variety of reasons. Some question the need for the technology; others question the practicality of each manufacturer using its own dashboard. In other cases, end users debate with facility owners as to who should pay for the technology. Despite benefits of connected restroom dispensers, floor care machines and even mops, most end users remain on the sidelines waiting for others to take the plunge into IoT to see if the rewards outweigh the costs. In the meantime, a new form of connectivity is generating hype in the industry. Evidence-based cleaning uses apps to have janitors clock in and out of each cleaning task. Based on these clicks, supervisors can track workers’ locations and see how long they are taking to clean. By analyzing the data, supervisors can see if training is needed, if workers are skipping tasks or if better procedures can be implemented. “Customers are looking for control of their workers. And with [this technology] they get it,” says Jussi Noponen, sales manager, Pancomp International, a software company in Oulu, Finland. Each shift, a janitor will use his or her mobile phone to access the app and receive a task list to complete for the day. With the swipe of a finger, a janitor can easily indicate when he or she started, finished or paused to take a break. These digital task lists reduce duplicated administrative job duties. Instead of requiring janitors to keep written records of their tasks, then have an office worker create a spreadsheet using this info, the app creates an instant dashboard. The technology can also be integrated into other software programs, such as timekeeping and invoicing. “Switching to an app saves 30 minutes a day, which is the equivalent of 26 days a year,” says Susie Bishop, marketing manager for software provider Squeegee, in Hereford, United Kingdom. Digital task lists and janitor tracking are just the beginning for this technology. In the future, its possible for apps to be connected to other real-time sensors in a facility that can generate new jobs. For example, after a restroom door sensor reads that “X-amount” of visitors have entered, a janitor can receive a new task on his or her phone to go clean the room. With a “needs-based” approach to cleaning, facilities receive immediate attention and janitors get to be problem solvers. Cleaning is not glamorous work and it can be difficult for janitors to become engaged. Initially, building service contractors worry that evidence-based cleaning may be too “Big Brother-ish” and lead to distrust of management. But, in fact, the reverse could be true, with the app helping janitors to take pride in their work. Although distributors won’t likely be the ones selling these apps, if evidence-based cleaning takes off, it could lead to even fewer sales of IoT related products if customers decide this is all the data they need.